If you’re living the life of the average professional, you probably have a lot going on during most days. At times, you might feel like a circus acrobat, walking on a tightrope, juggling several balls in the air. If you’re lucky, you might get through the act without dropping any balls. For most individuals, it’s a challenge to maintain balance while going through their hectic schedules. According to a poll done by Harris Interactive, today’s employees are under more stress than ever before, with one-third of workers burned out by their jobs. This has led to a staggering increase in stress-related illnesses such depression, anxiety, insomnia, migraines and adult ADHD. This clearly indicated that the average worker finds it challenging to maximize their time and performance. The problem is that we have a limited number of hours in a day and you can only do so much in 24 hours. Besides adding more hours to the clock, the only other alternative is to do more in less time without burning out and running yourself to the ground. 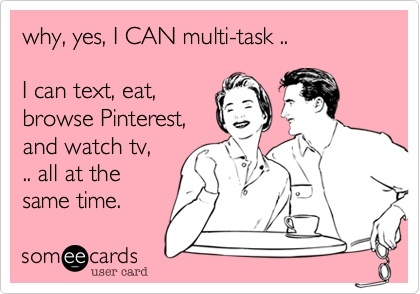 And that’s where multi-tasking comes into the picture. Multi-tasking is a skill that can help you get more done in less time, if it’s done correctly. While some people find multi-tasking to be a breeze and a way of life, others either resist doing it or they tolerate it so that they can stay in the game long enough to get things done. Those who find multi-tasking to be exhausting and unnatural will eventually experience the draining effects of it. Science has proven time and time again that it’s counter-productive to tackle two or more things simultaneously because our brains cannot withstand the cognitive overload. Your mind will freeze, just as how a computer locks up when too many windows and programs are open. Repeatedly switching your mental focus also reduces your overall productivity. Information can only be effectively processed if you give it your undivided attention. Since you’re not giving your full attention when you multi-task, you’re prone to making mistakes and missing out on important details. Sometimes, being distracted can be lethal, as in the case of those who lost their lives because of texting while driving. Multi-tasking also prevents you from experiencing the pleasure that comes from being fully immersed in an activity that you enjoy. This steady state of awareness, also known as “flow”, can only occur when your focus is on the present moment. If your energy and focus is scattered between multiple things, you’ll miss out on the nuances and rich textures that comes from being present to everyday moments. But despite the disadvantages, multi-tasking remains an indispensible skill when it comes to handling the crazy demands of a modern-day existence. The key is realizing that multi-tasking isn’t something that requires you to pile on work to the point of exhaustion but a handy technique that you use to channel your energy effectively, by slowing down and maintaining your highest level of mental functioning. Time-sharing is a method that can overcome this singular-focus problem by helping you focus on one task, then swiftly allowing another to take its place – similar to how vacationers occupy timeshare property. This shift happens so quickly that you don’t even notice that you’re only doing one thing at once. It may feel like you’re multi-tasking when you’re actually time-sharing. The good news is this time-sharing version of multi-tasking is something that can be learned, but it will require prioritization, adaptability and discipline on your part. If done correctly, it can bring order and control to your life. 1. Plan well and stay organized: Effective multi-tasking begins with good planning and preparation. This involves creating a plan of action (POA) that takes all major factors into account, such as the complexity of the task, time, and your energy levels. When you have a solid POA, it will be much easier to jump from one task to another. In a chaotic environment, you’ll also need to create systems to ensure that your plans to complete important projects don’t slip through the cracks. Your workflow is significantly driven by your environment, so you need to create structure to avoid feeling scattered and all over the place. Use tools such as post-it notes, apps and lists that are color coded and highlighted with the most important tasks to be completed. To avoid wasting brain energy, create lists of items you refer to often, such as contact information, recipes, or anything else that you would like to have quick access to. 2. Prioritize and manage time: There’s always going to be a hierarchy when it comes to the level of importance of the tasks on your POA. You should always aim for having high-priority items at the top of the list and the low-priority items at the bottom. You can prioritize items based on a variety of factors such as time, emotional significance or financial outcomes. Effective multi-tasking also requires excellent time management skills and the use of tools such as calendars and schedules. Maintaining and honoring your calendar can provide a lot of relief and control in your life because once you write/type it out, you don’t have to keep everything in your head and complicate your already busy life. 3. Finish each task and release: When we multi-task, we must build our capacity to switch gears and give 100% focus to the activities at hand. When you finish one task and move on to the next, you want to avoid letting your thoughts linger on about the task that you just finished. After you complete a task, release all the emotional energy related to the task, so that you can create space for new information to come in from the next task that you’re tackling. I like to visualize myself closing a file and putting it away in a filing cabinet when I’m done with a task. When it’s done, I no longer feel the need to think about it. 4. Find the right combo of activities: Grouping similar activities together so that you don’t have to make large mental adjustments between tasks will help in preserving your mental energy and also save you a lot of time. Your brain needs to adjust every time you move on to a new activity and it has to activate a new set of circuits and neurons. Even though this shift happens quickly, it does take a toll on your productivity, focus and your memory. You can minimize the switching cost by bundling similar activities together so that you can move fluidly between them. Completing several activities that are similar at the same time will cut down on the need for you to change hats more often than necessary during the day. 5. Maintain inner balance: You cannot perform the mental acrobatics of multi-tasking if you don’t have a basic foundation for wellness and you’re unable to manage your energy levels while going through your tasks. Following a balanced regime of eating healthy, and getting enough exercise and sleep will ensure that your mind is performing at peak level and has strong cognitive endurance and agility. Also, avoid energy-draining activities that deplete your reserves and your ability to focus. While multi-tasking, it’s important to take regular breaks throughout the day to clear your head and give your mind the chance to relax and reboot. The brain requires constant replenishment because it uses more energy than any other part of the body. 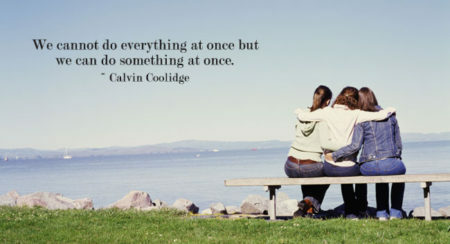 For this reason, it’s important to stop multi-tasking every 2-3 hours and give it the rest it needs. After the rest period, you’ll feel alert, refreshed, and ready to plow through your tasks. The most important thing to keep in mind as you tackle your to-do lists is to know, deep in your bones, that no matter what does and doesn’t get done at the end of a day, you are enough. 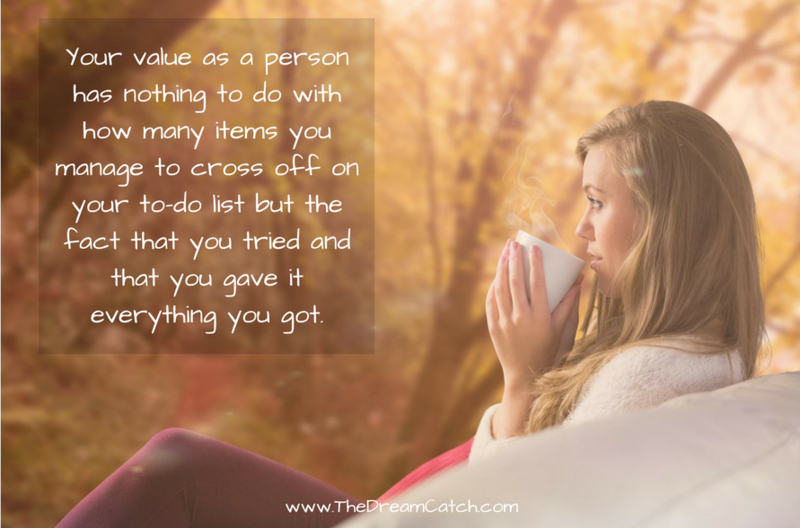 Your value as a person has nothing to do with how many items you manage to cross off on your list but the fact that you tried and that you gave it everything you’ve got. Question for you: Do you find it easy to engage in effective multi-tasking? If not, what challenges are you facing? I am Rashmi Khanna and I stumbled across your website on Google and found it very informative and engaging. I would like to tell you that I am looking to contribute on your blog on similar categories i.e Business and the theme of my website is relevant to yours. Hey Seline, do you have any more tips for someone who has really struggled with making the whole multi-tasking thing work for them? I have really been struggling to get started!